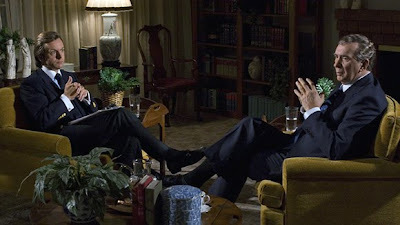 Exuding class and almost effortless direction, Frost/Nixon is probably Ron Howard’s best film to date. Before giving him all the credit however, it needs to be said that the film succeeds so well mainly because Peter Morgan had already given the director a decidedly juicy script to work with. Without it, cries of boredom may well have been heard as let’s face it, this is a film merely about a few interviews between two men. Meaning, its success has more to do with writing and performances than direction. Howard does create a sleek and perfectly paced two hours of course - no mean feat in itself when you have such a dialogue driven setup. To make it compelling, almost edge of your seat material as well, is even more of an accomplishment. Ultimately, the combination of Morgan’s muscular writing and Howard’s increasingly developing flair behind the camera has proven a real winner. Within that impressive combination is a fantastic cast from the ground up. All one can really do when the film settles in, is just sit back and be thankful. The film is so engrossing, it might be easy to forget that the subtely sublime performances are what's keeping the story moving. Playing the titular characters, the transition from the stage (where they performed it on Broadway and London) to screen for Michael Sheen and Frank Langella is smooth and without stumble. Both outstanding as David Frost and Richard Nixon respectively, one can’t go past singling out Langella as the disgraced former president. He inhabits the man to jaw dropping effect and by the end, the actor has all but vanished inside, right down to the slouch and mumbling, gruff speech. A strong supporting cast of Kevin Bacon, Sam Rockwell and Toby Jones amongst others adds impressive weight around the them. Everybody is on top form. The decision to intercut after-the-fact reflections from the side players proved to be a smart move by Howard too, and it gives the whole thing more of a sense of a historic event - and definitely adds to the cinematic feel separating it from the confines of a theatre. It is a juxtapose that takes a minute to get used to, but overall breaking the flow of the story this way helped tell it and fittingly, gives us the point of view of everybody involved besides just our two prize fighters. In the end, the film’s exploration of television, in an era when it's power was misunderstand by many, to Nixon’s deflated arrogance in defeat is exceptional. Frost landing his ‘confession’ and the close up - the one you can’t hide from, showing a man full of self-loathing, and the subsequent impact of that moment on the 45 million viewers, is drama at it’s best. The scene is the crux from which the whole film and indeed, the interviews themselves, were built around and if Langella didn’t pull it off, Frost/Nixon would have been a missed opportunity unimaginatively. It’s no surprise then that he does and even though the veteran actor had the stage play to perfect it, it’s still one of the most bravura performances in a long time in a film worthy of praise.